Transformers! Wow, what an enigmatic item they have become. Ignorance of how this chunk of iron works seems to be rather wide spread, as evidenced by some recent events. A short time ago, I read an article about building a single-ended 2A3 amp. The builder said he had a transformer that was 8-ohm on the secondary and 5k-Ohm on the primary. So in order to present the recommended 2500-ohm to the 2A3, he said he would use just one-half of the primary. The 2M does like a 2500 ohm load, but he will have 1250 ohm if he uses only one-half of the primary. Then along came this article “Audio Uses of Transformers”. I am activated! I will offer some observations about item numbers 7, 8, and 9 that he mentions. While I think everyone would like to avoid that evil black chunk of iron, it’s best to learn some facts about this mysterious heavyweight by reviewing some of the laws and rules of inductance and iron-cored transformers. 1. Transformers only work with alternating current. 2. Their inductance varies as the square of the number of turns of wire wound on the iron core; i.e., if you cut the number of turns in half, you reduce the inductance to one-fourth of what it was. 3. You determine the impedance ratio of a transformer by squaring the turns ratio of the primary to the secondary or the reverse in order to get a whole number and not a fraction. Now you are going to say, “I don’t know anything about the number of turns on the transformer, what else can I do?” Well, for iron-cored inductors, the turns ratio is the same as the volt age ratio of the two windings involved. Use your ohmmeter to determine which winding has the highest DC resistance. Get out your AC voltmeter and a source of AC voltage, such as a Variac or another transformer with about 50V out. Put this AC voltage on the highest resistance winding. Mea sure the input voltage and the voltage across one other winding on the transformer. Perform division of the volt ages in order to get a whole number and not a fraction. Square this number and you have the impedance ratio of the transformer for the windings involved in this measurement. Now this transformer is not so much of a mystery. Suppose when you had 50v on the high resistance winding, you had 3V on the other winding. Fifty divided by three = 16.666. If you square 16.666, you have 277.76, which is the impedance ratio of this unit using only these two windings. The impedance ratio will be different if you use other windings. If you want to put an 8-ohm speaker on this smaller winding, consider a 2222.1-ohm (277.76 x 8) impedance to a load. If I put a 4-ohm speaker on the smaller winding, I will only present 1111-ohm to the load. Note how much the primary impedance changes when you go from 8-ohm to 4-ohm. Many people indiscriminately hook up various speakers with different impedances on their amplifiers and expect them to perform equally well. For another example, I have a transformer with a 10k-ohm primary. The secondary is 4, 8, and 16 ohm. Using the 16-ohm winding, I divide 10,000 by 16 ohm and get 625. This is the impedance ratio of this transformer using only the 16 secondary winding, if I put an 8 speaker on the 16 ohm winding, the primary will look like 625 x 8, or 5k-ohm. Now, how much power will a transformer handle? Tough question. I generally figure 3 lbs = 25W, 6 lbs = 50W. This is not always a good guide, as some primaries are limited in that they will only carry so much current. If you have two transformers with the same specifications, and one has a larger iron core, by all means use the one with the larger core. It will be less likely to saturate from the DC going through. It will also have a better frequency response. Audio enthusiasts will value the fundamentals discussed here in this examination of transformer types. Above: Fig. 1: FULL-WAVE CHOKE INPUT. Above: Fig. 2: FULL-WAVE CAPACITOR INPUT. Here is an interesting fact: an ordinary 6.3V filament transformer has a voltage ratio of 19.75. Square this and you have 389.7, the impedance ratio of this transformer. Put an 8-ohm speaker on the secondary, and the primary will look like 3117-ohm. You might use this on a single-ended 2A2 and the low frequencies will sound good. The highs won’t be too good. If you are a single-ended fan, there is another consideration to look at. A transformer that has linear taps can provide some more options. Let’s say the linear tap is a 40% one. This means that the transformer has a tap 40% of half the primary away from the center point of the whole winding. Actually, that 40% is only 20% of the whole winding, if you add 20% to 50%, you have 70% of the winding. Now, square .7 to get .49. if the whole primary has 5k-Ohm, then .49 x 5000 gives 2450 as the primary impedance. This is the primary impedance using one 40% tap and the opposite end of the winding. These statements hold true if an 8-ohm load is put on the 8-ohm tap of the secondary. If an 8-ohm load is put on the 16-ohm tap of the secondary, the primary will look like 1225-ohm. Most builders of tube amps think that only one specific transformer will work on the output of their project. What I have just said might change that thinking. Most transformers are quite versatile. I have a Hammond 16500N output transformer that has been adapted to many different tube loads with great success. A choke—at least the kind you use in the audio world—is an iron core with only one winding on it. A choke is rated in henries and current-carrying capacity. Its DC resistance is so low that it’s generally ignored. A choke’s value lies in its ability to do two things. 1. It can store energy. DC current flowing through the winding sets up an electric field that acts like a storage battery. When the current is shut off, the choke actually tries to keep it flowing. If the current flow subsides, the choke tries to keep it at its original level, if a bump of current comes along, the choke absorbs it in its magnetic field, thus preventing the bump from going further. It’s a smoothing device. As such, it’s a very useful component in power supplies. In power supplies, the minimum value to use is given by the following formula: inductance in henries = the output voltage divided by the load cur rent in milliamperes. A 300V supply with a 100mA load should have a choke of 3H or more, A choke’s second ability is its resistance to the flow of AC current. However, this resistance varies with both the inductance in henries and the frequency. Above: Fig. 3: FULL-WAVE BRIDGE. C = 0.01uF. R = 500,000 ohm. If the inductance is fixed at a certain value, then the resistance will be much higher at high frequencies than at low frequencies. Reactance = 2 x 3.1416 x the frequency x the number of henries in the choke. By the same figuring, if the frequency stays at a fixed value, in creasing the number of henries in creases the resistance to the flow of AC current. From a practical standpoint, this means that in a single-ended amp with parallel or choke feed, the lows will be reduced a bit by the choke. Compensation for this can be included in the preamp. If you have an SE amp with choke feed, the load impedance on the out put tube looks like a very complicated situation. The tube plate is looking at two inductances in parallel. In many cases, the inductance of the choke is equal to the inductance of the primary on the transformer. They are in the circuit in an almost identical manner. Both have one end tied to the tube, and the other ends go to ground through a large capacitor. Now for the differences that exist. The choke is carrying a large DC cur rent, which will have no reactive effect on the tube if its iron core is big enough. It is, however, carrying a relatively small AC current to ground from the tube, the amount being governed by the reactance the choke presents. The transformer’s primary may show a very high reactance if its secondary is open. But as soon as a load is put on this secondary, you have changed the situation substantially. The primary impedance of this transformer is being controlled more or less by its secondary. In the case of a transformer with an impedance ratio of 325, 8-ohm on the secondary is reflected in the primary as 2600 ohm, 50 ohm on the secondary is reflected as 16250. Thus you can say that the transformer is the most important factor governing the load of a tube. Its impedance is very low compared to the impedance of the choke, and it’s in essence the only load. At this point, someone is going to bring up the fact that the inductances of the choke and transformer are in series with a capacitor and could be in resonance at some audio frequency. Forget it. With the value of components you use at audio frequencies, you will never be bothered with that problem. Power transformers are rather commonplace items that you often take for granted. You either buy one and hope ii fits the job or you pull one from the junk box and make it fit the job. In spite of what you pick, it never seems to be big enough. So right now, resolve to use the biggest transformer you can obtain for the job at hand. Forty to 50% over what you think you need will always work out fine. A bigger transformer will have larger wire on the secondary. This means a lower resistance secondary, which is a definite plus. You can use either half-wave or full- wave rectification. But don’t even consider the half-wave route because it just can’t cut it. Too much hum f any audio purpose. I also caution you not to work from the power mains directly. It’s too dangerous. Use a transformer. There are three ways to get full-wave rectification. 1. Use two diodes with the center tap of the secondary on ground. 2. 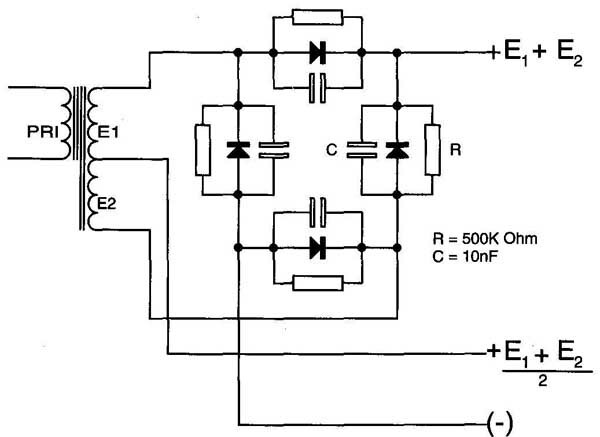 Use four diodes in a bridge circuit. 3. Go the voltage doubler route. Yes, there is a full-wave doubler circuit, which is used more often than you might think. It just takes a lot of capacitance (see Figs. 1,2,3, and 4). The number one route is the preferred one to take. If you use choke input, the transformer will love it. Output voltage is generally 0.9 x one-half of the total voltage out of the secondary. Using number one to capacitance input is harder on the transformer and may cause it to heat a little. With capacitance input, the output voltage is about 1.1 x one-half of the secondary voltage. Going the second route, with four diodes, on a transformer intended for use with the two diode system, causes a little problem. If the transformer is rated at 200mA, you should not try to get 200mA out of it. It will run hot be cause the whole secondary is in use all the time. I would de-rate the transformer about 30%. The bridge circuit provides two volt age outputs. 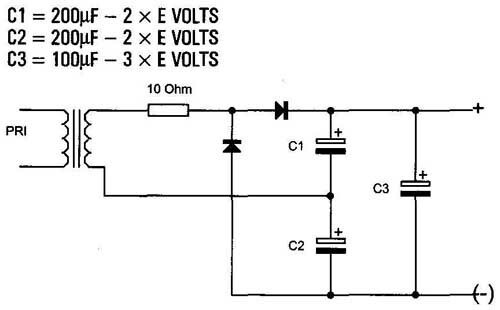 One is the same as in the two diode system, and a second voltage twice that of the two diode system. You can alter both voltages by using either a choke or capacitor input. If the transformer secondary has no center tap, then only the higher voltage will be available. With the voltage doubler circuit, the same caveats from the bridge circuit apply. The whole secondary is in use all of the time. The doubler system is a good one to use when you have a low voltage transformer without a center tap. You should be prepared to accept poor voltage regulation with a voltage doubling circuit. If your amp is running class A, there is no problem, as the load has very little variation. A good transformer for use in the voltage doubling circuit is an isolation transformer that has a 120V primary and a 240V secondary. One rated at 100 to 150 VA would be suitable. You can alter the voltage obtained from any of these systems either up or down by using spare filament windings on the main transformer or by using a separate filament transformer. I would not recommend raising the transformer- rated primary voltage by more than 6 or 7%. To do so stresses the transformer too much. You can reduce the transformer primary voltage as much as you care to without damage. The spare windings are used in series with the main transformer primary. You can wire them in aiding or opposing the supply mains. 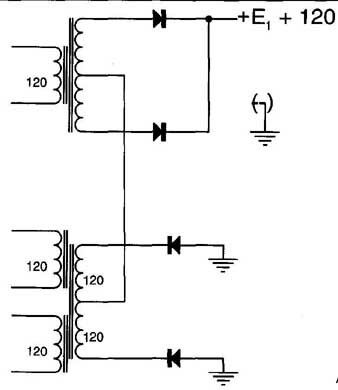 There is an unusual way to pick up an additional 45 to 115V on top of the main transformer supply if you have an isolation transformer with two separate primaries and two separate secondaries ( Fig. 5). Above: Fig. 4: FULL-WAVE DOUBLING CIRCUIT. Many times, the problem is not one of voltage, but of not enough current to do the job. You can parallel identical transformers without trouble, but don’t try it with unlike transformers. If you have spare transformers around or can pick some up at a flea market, some of the configurations mentioned previously can enable you to put together a good supply at a reasonable cost. Diodes sometimes can generate noise in the power supply. You can eliminate or greatly reduce this by the use of bypass capacitors and resistors as shown in Fig 3. I would like to add a thought here about what a power supply looks like to an amplifier. It makes a big difference in sound if the amp is looking at a low impedance supply. With the average supply, you generally have about 40 to 80 of capacitive filtering. This is not nearly enough to offset the highly inductive transformer and choke. The addition of 500 to 700 j on the output of the supply will lower the reactive impedance and make the supply look more like a resistor. I think that a large capacitive output also acts as a regulator, and sometimes makes a regulated supply unnecessary. Believe me, it sure improves the response of the amp. Many builders use DC on the filaments of their tubes. Here is a little tip to prolong the life of tungsten filaments: Put a DPDT switch in the filament line to reverse polarity every 100 hours. It’s a proven fact that tungsten migrates from the filament with pro longed application of fixed polarity direct current. You can increase tube life 50 to 75% by switching polarity.